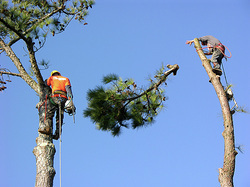 Fully Insured Coppell Tree Service - Free Quotes! "Stop paying for foreman and salesmen! at a great low price. I take pride in all my work and it shows!" Tree haul away services included. Coppell is a thriving part of the metroplex located equidistant from Dallas and Fort Worth. As such, it serves as a viable center of commerce and commercial work. We've been assisting with work in the area and look forward to earning your business. We have references upon request.